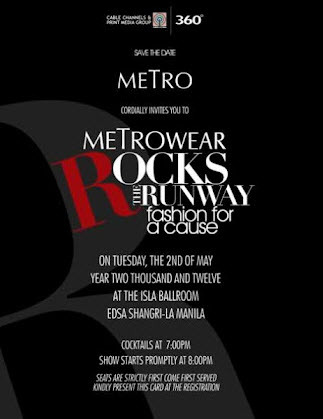 Metro Magazine takes to the fashion stage anew with the latest installment of its much anticipated fashion series, Metrowear Rocks The Runway on May 2. The show will feature a stellar combination of music and fashion as it showcases 20 designers and their unique interpretation of sustainable fashion. Each designer was tasked to re-imagine, innovate and transform various concepts and perceptions of eco-fashion into sleek and stylish pieces highlighting three of the biggest trends this season: Aquatic, Retro Romance and 1950s Couture. Among the designers who will be presenting at the show are Cary Santiago, Joey Samson, Avel Bacudio, Randy Ortiz, Francis Libiran, Dennis Lustico, Louis Claparols, Ronaldo Arnaldo, Jojie Lloren who will be paired with young designers: Sassa Jimenez, Kermit Tesoro, Mak Tumang, Ferdie Abuel, Eric delos Santos, Jerome Lorico, John Herrera, Veejay Floresca, Roland Alzate, and Martin Bautista, among others. Kapamilya stars show off their stylish side as they take the opportunity to prance down the Metrowear catwalk. Hunky actors Rayver Cruz and Zanjoe Marudo join PBB Unlimited big winner Slater Young in modeling a modern take on menswear. Young fashionista and popular actress Kim Chiu will walk down the runway in a stunning creation by Francis Libiran. The beautiful and stylish Maja Salvador will appear in an dress by Avel Bacudio. As a musical backdrop to the show, four of the most exciting Filipino rock acts – Wolfgang, Kjwan, Callalily and Rico Blanco – will serve up their biggest hits and add an edgy element to this Metrowear presentation. Metro magazine celebrates 23 years of iconic style with a special anniversary gatefold cover which features dramatic actress Judy Ann Santos, award-winning actor Piolo Pascual and ingenue Maja Salvador.